Los Angeles-based design studio Adam Voorhees has collaborated with a renowned European shipyard on a 100 metre superyacht concept that takes its inspiration from Hollywood glamour and a classic British sportscar. Adam Voorhees, creative director of the self-named studio, is known for pushing the boundaries of design in its juxtaposition with the natural environment. True to his philosophy, he said of this latest project that the “unique layout diffuses strictly delineated interior versus exterior space to instead develop a rhythmic interplay with the landscape and create a dialogue with the surrounding environment”. Given the location of the Voorhees studio, it’s unsurprising that he should turn to Hollywood for some direction. In an exclusive statement to Boat International, Voorhees said, “We are pleased to announce a fresh 100 metre superyacht concept inspired by a Californian sensibility of casual luxury and Hollywood glamour. 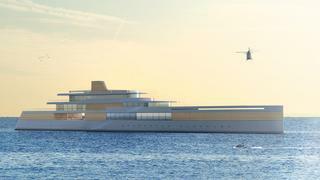 The 100 metre yacht will boast such features as a glass walled infinity pool penetrating into the extensive spa facilities, a protected yet open sea lounge, and ultimate sea views through full height glazing. Adam Voorhees’s announcement of the ‘Hollywood’ project follows confirmation in January that the studio was working on the refit of the Bruce Farr racing yacht Sapphire Knight at the Seaway yard in Monfalcone, northeast Italy. This project will see a metre added to Sapphire Knight’s LOA at the transom, turning her into a 26m fast sailing yacht. She will have a new deck and deckhouse fitted, along with a new mast and boom. There will also be keel modifications. The interior will be completely redesigned and decorated. Kevlar and carbon are the main build materials.